Let me just say that I love bundt cakes -- obviously not as much as everyone who participates in the I Like Big Bundts event, but then, I'm not sure I'd want to. In any case, take homemade whole cranberry sauce, add roasted almonds, moist vanilla-sour cream cake and a sinful cranberry glaze, all topped off with homemade nutmeg whipped cream and you have yourself a decadent holiday dessert that is gluten free and glorious. Make one large bundt cake (if I had any of these epic bundt pans I wouldn't hesitate for a second) or 4-6 mini bundts, just make sure you follow the proper "fill to" directions in the recipe and adjust your baking time accordingly! Preheat oven to 350° F. Butter and GF flour your bundt pan(s). 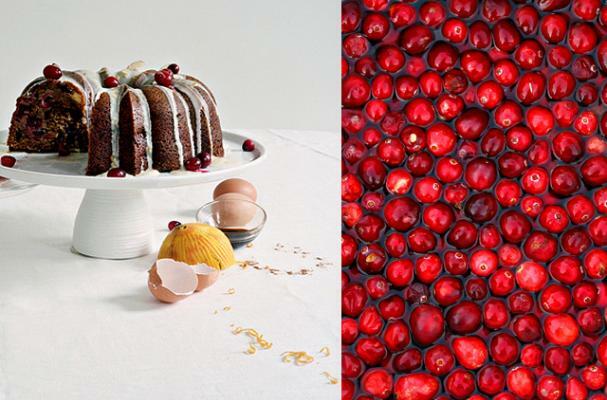 Prepare cranberry sauce and glaze (recipes provided below). In the bowl of a stand mixer, beat together butter and sugar until pale, light and fluffy. Add vanilla and then eggs, one at a time, until full incorporated. Whisk together dry ingredients in a separate bowl. Alternating with 1/2 c crème fraiche, add dry ingredients to the butter-egg mixture in 3 parts (one scoop dry, 1/2 c crème fraiche, another scoop of dry, 1/2 c crème fraiche, the last bit of dry), only mixing until just combined. Fold in almonds. Pour the batter into your prepared bundt(s), only until each pan is 1/4 full. Add a layer of cranberry sauce (pans should be 1/2 full), then the remaining batter -- all 3 layers should leave your pan 3/4 full. Bake for 25-35 minutes, depending on the size of your bundts, until the tops are golden brown and springs back lightly when touched. Allow cakes to rest for 15 minutes before turning out onto a wire rack to cool. Once the cakes are completely dry (1-2 hours), dip them in the cranberry glaze - rounded side down - and place them back on a wire rack set with newspaper or a baking sheet underneath to catch the drippings. Serve with a dollop of nutmeg whipped cream and a mug of brandied eggnog. 2 cups heavy cream (pastreurized not ultra-pasteurized if you can find it) + 2 Tbsp sour cream/buttermilk. Whisk together heavy cream and sour cream/buttermilk; pour in a glass bowl (or measuring cup or mason jar) and leave on the counter overnight. Refrigerate at least 4 hours before using. Whisk all ingredients together in a bowl deep enough for dipping bundts. Mixture should be fairly thick, but milk can be added to loosen it up if needed. In a bowl with a handmixer (or in the bowl of a stand mixer), combine all ingredients and beat (with whisk attachment) until peaks form -- better be too stiff than too soft or your whipped cream will look like a melted snowman. Store in the refrigerator for up to 10 days. Recipe lovingly adapted from Caren Blair. thank you for posting this gluten free version of this cake. i not only have gluten issues, but also" FODMAPS", diet is my new challenge. i am allowed almonds and cranberrys, couldn't wait to get through dinner to eat this cake. all of the gluten eating family thought it was great!